According to the weather log, we had rain seventeen out of 31 days in October! As a result, I rode about 20 hours less than I did last October. I am pretty much a fair weather rider and it was just a nasty, nasty month. But there is good news! I think November is paying us back for such a crappy October. We have had some gorgeous days – in the low 70’s this last week. 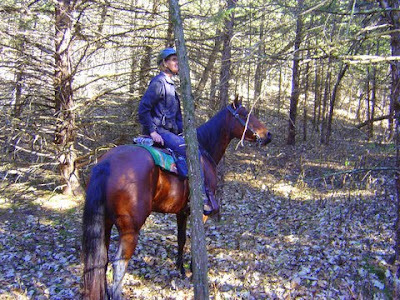 I’ve been lucky to spend some time on the trail with my horse, a few good friends and even my son, Case, and his friend joined us! Now Case joining us was quite by accident. Seemed the Junior High was out of school on Friday. A little tidbit on the school calendar that I didn’t make note of until about Wednesday. And Case had invited a friend over to spend the day. Well, his friend caught wind that I was going riding Friday afternoon and told Case that he would like to ride a horse, too. Case was thrilled – NOT, but in an effort to please his friend, took one for the team. I always enjoy watching my boys ride whether they want to or not. Having been on a horse since he was three, Case looks like a natural and has much better balance than I will ever have. 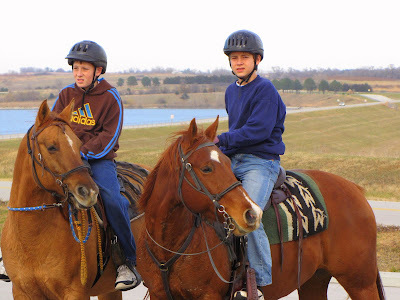 I no longer have my heart in my throat when he rides, but watch now with pride, as both my boys have become good hands. Case's friend, Seth, had fun and was quite curious about where I planned to ride the following day. I think I could have had a date, if I asked. 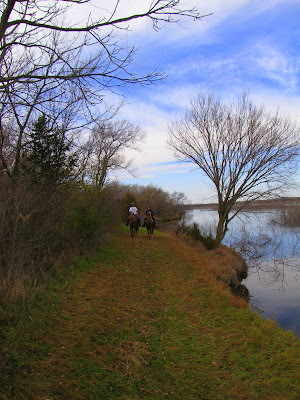 Sheila and Deb met us at Branched Oak Lake on their good horses, Jake & Jim. The sky stayed overcast most of the day, but the temperature was pleasant. Sweatshirt weather at its finest! 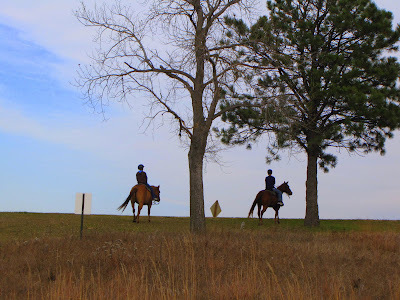 We rode just under 7 miles, unsaddled and let the horses graze as we enjoyed some fattening snacks. The following day, I met my Shari at Camp Moses. While we usually enjoy the foliage change at Camp Moses, due to wet weather and trails, we haven’t been there since September. The leaves have long since dropped, making a crispy covering over the trails. But the landscape was still beautiful in its own way. We saw a lot of deer and the biggest flock of wild turkeys I have ever seen. Temps are expected to drop about 10 to 15 degrees next week. Still doable, but with the end of daylight saving time, it’s now dusk when I get home. Hoping November gives us another few weekends like the one we just had. Perfect restitution for October. Sounds like you guys had a lot of fun. Now, don't go hitting on them younger boys! lol! October was miserable. But we've had some really nice rides this November. I hope the weather holds for a while too. Glad you and everyone got out and had fun. Awww, the pic of the boys was great! I can see why you were so proud of them. We've had beautiful weather here for over a week, but the days are shorter and we could still use some rain. We only had about 3 good rains all year...not enough. And I don't want to make it up in snowfall either. Great picture of Windy checking out the turkeys! Oh you..those rides looked great! I LOVED you and Windy, looking a the Turkey!